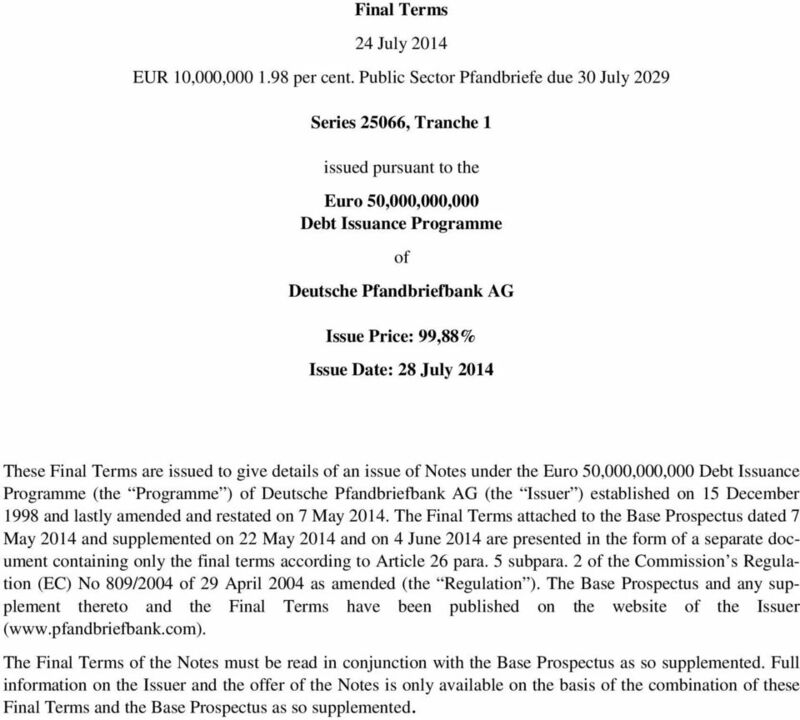 Download "Final Terms 24 July 2014 EUR 10,000,000 1.98 per cent. 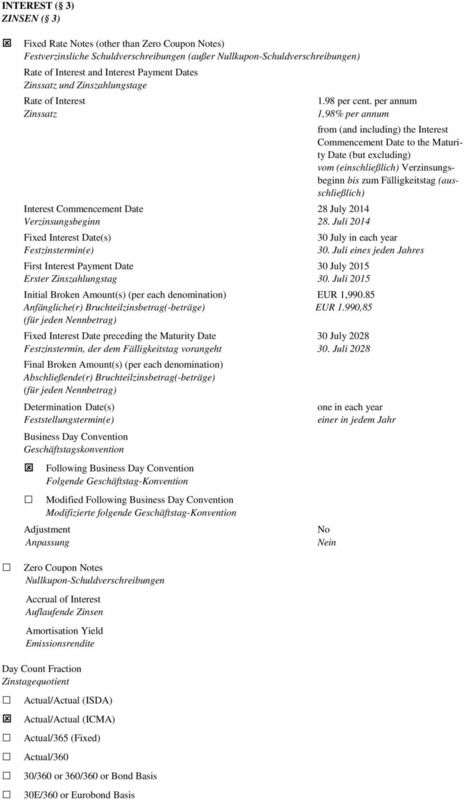 Public Sector Pfandbriefe due 30 July 2029. Series 25066, Tranche 1"
1 Final Terms 24 July 2014 EUR 10,000, per cent. 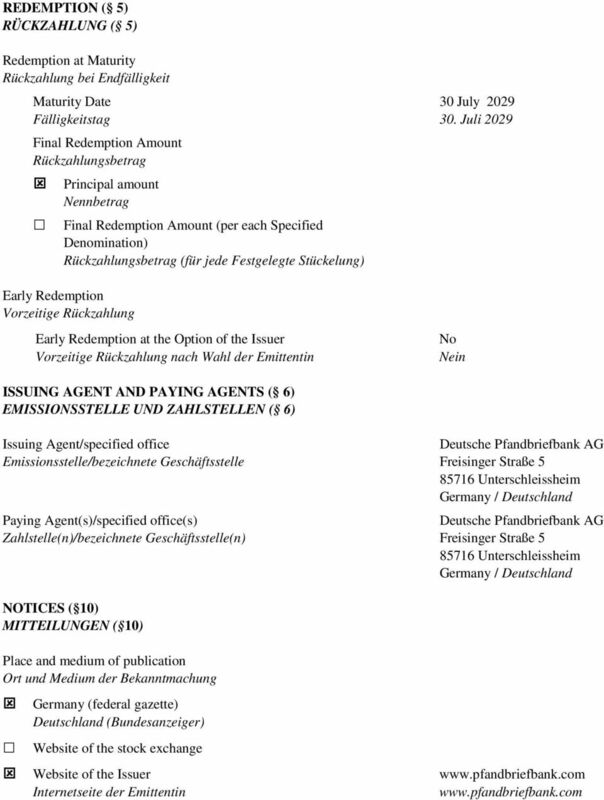 Public Sector Pfandbriefe due 30 July 2029 Series 25066, Tranche 1 issued pursuant to the Euro 50,000,000,000 Debt Issuance Programme of Issue Price: 99,88% Issue Date: 28 July 2014 These Final Terms are issued to give details of an issue of Notes under the Euro 50,000,000,000 Debt Issuance Programme (the Programme ) of (the Issuer ) established on 15 December 1998 and lastly amended and restated on 7 May The Final Terms attached to the Base Prospectus dated 7 May 2014 and supplemented on 22 May 2014 and on 4 June 2014 are presented in the form of a separate document containing only the final terms according to Article 26 para. 5 subpara. 2 of the Commission s Regulation (EC) No 809/2004 of 29 April 2004 as amended (the Regulation ). The Base Prospectus and any supplement thereto and the Final Terms have been published on the website of the Issuer ( The Final Terms of the Notes must be read in conjunction with the Base Prospectus as so supplemented. Full information on the Issuer and the offer of the Notes is only available on the basis of the combination of these Final Terms and the Base Prospectus as so supplemented. 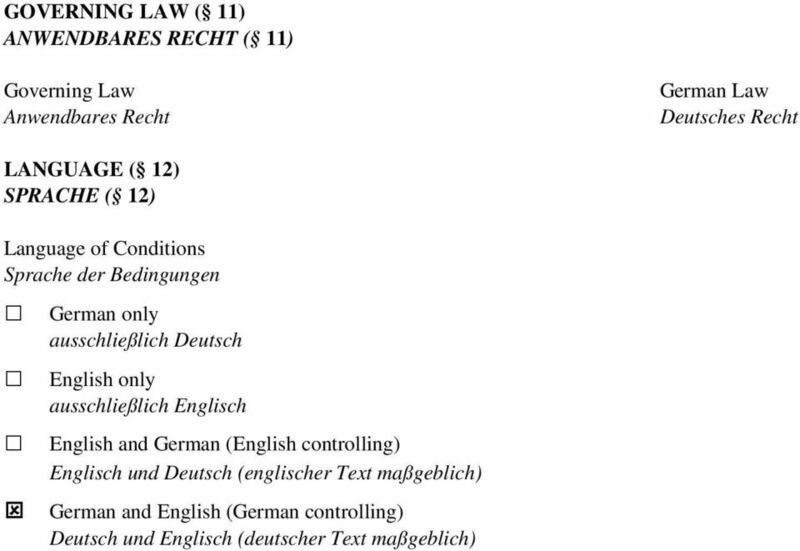 2 PART I CONDITIONS TEIL I BEDINGUNGEN Terms not otherwise defined herein shall have the meanings specified in the Terms and Conditions, as set out in the Base Prospectus (the Terms and Conditions ). Begriffe, die in den im Basisprospekt enthaltenen Emissionsbedingungen (die Emissionsbedingungen ) definiert sind, haben, falls die Endgültigen Bedingungen nicht etwas anderes bestimmen, die gleiche Bedeutung, wenn sie in diesen Endgültigen Bedingungen verwendet werden. The Terms and Conditions shall be completed and specified by the information contained in Part I of these Final Terms. The relevant Option V of the Terms and Conditions, completed and specified by, and to be read together with, Part I of these Final Terms (Reference Conditions) represent the conditions applicable to the relevant Series of Notes (the Conditions ). If and to the extent the Conditions deviate from the Terms and Conditions, the Conditions shall prevail. If and to the extent the Conditions deviate from other terms contained in this document, the Conditions shall prevail. Die Emissionsbedingungen werden durch die Angaben in Teil I dieser Endgültigen Bedingungen vervollständigt und spezifiziert. Die Option V der Emissionsbedingungen der Schuldverschreibungen, vervollständigt und spezifiziert durch und in Verbindung mit Teil I dieser Endgültigen Bedingungen (Verweis-Bedingungen) stellen für die betreffende Serie von Schuldverschreibungen die Bedingungen der Schuldverschreibungen dar (die Bedingungen ). Sofern und soweit die Emissionsbedingungen von den Bedingungen abweichen, sind die Bedingungen maßgeblich. Sofern und soweit die Bedingungen von den übrigen Angaben in diesem Dokument abweichen, sind die Bedingungen maßgeblich. 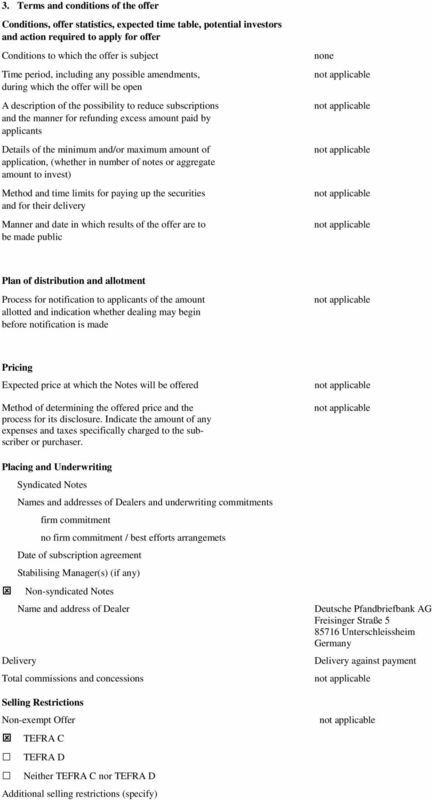 This Part I. of the Final Terms is to be read in conjunction with the set of Terms and Conditions that apply to Pfandbriefe with fixed interest rates set forth in the Base Prospectus as Option V. Dieser Teil I. der Endgültigen Bedingungen ist in Verbindung mit dem Satz der Emissionsbedingungen, der auf Pfandbriefe mit fester Verzinsung Anwendung findet, zu lesen, der als Option V im Basisprospekt enthalten ist. All references in this part of the Final Terms to numbered paragraphs and subparagraphs are to paragraphs and subparagraphs of the Terms and Conditions. Bezugnahmen in diesem Abschnitt der Endgültigen Bedingungen auf Paragraphen und Absätze beziehen sich auf die Paragraphen und Absätze der Emissionsbedingungen. All provisions in the Terms and Conditions corresponding to items in these Final Terms which are either not selected or completed or which are deleted shall be deemed to be deleted from the terms and conditions applicable to the Notes. Sämtliche Bestimmungen der Emissionsbedingungen, die sich auf Variablen dieser Endgültigen Bedingungen beziehen und die weder angekreuzt noch ausgefüllt werden oder die gestrichen werden, gelten als in den auf die Schuldverschreibungen anwendbaren Emissionsbedingungen gestrichen. 7 PART II OTHER INFORMATION 1. Essential information Interest of natural and legal persons involved in the issue/offer Save as discussed in the Base Prospectus in Section XIII. Subscription and Sale, so far as the Issuer is aware, no person involved in the offer of the Notes has a material interest in the offer. 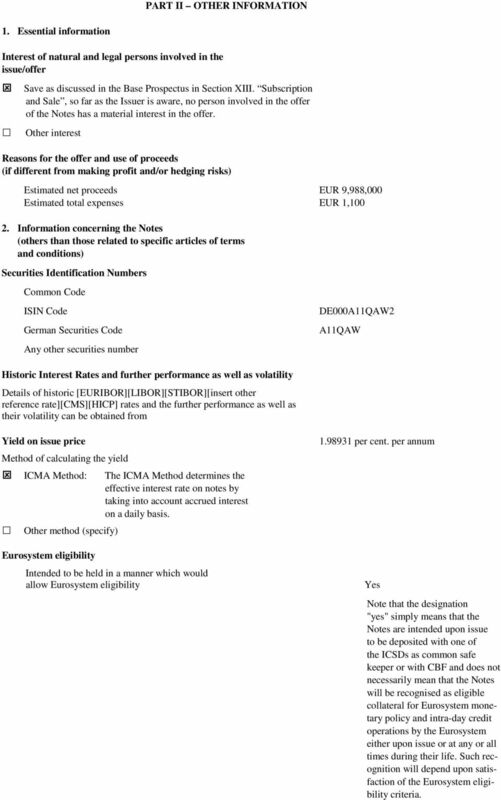 Other interest Reasons for the offer and use of proceeds (if different from making profit and/or hedging risks) Estimated net proceeds EUR 9,988,000 Estimated total expenses EUR 1, Information concerning the Notes (others than those related to specific articles of terms and conditions) Securities Identification Numbers Common Code ISIN Code German Securities Code Any other securities number DE000A11QAW2 A11QAW Historic Interest Rates and further performance as well as volatility Details of historic [EURIBOR][LIBOR][STIBOR][insert other reference rate][cms][hicp] rates and the further performance as well as their volatility can be obtained from Yield on issue price Method of calculating the yield ICMA Method: The ICMA Method determines the effective interest rate on notes by taking into account accrued interest on a daily basis. Other method (specify) Eurosystem eligibility Intended to be held in a manner which would allow Eurosystem eligibility per cent. 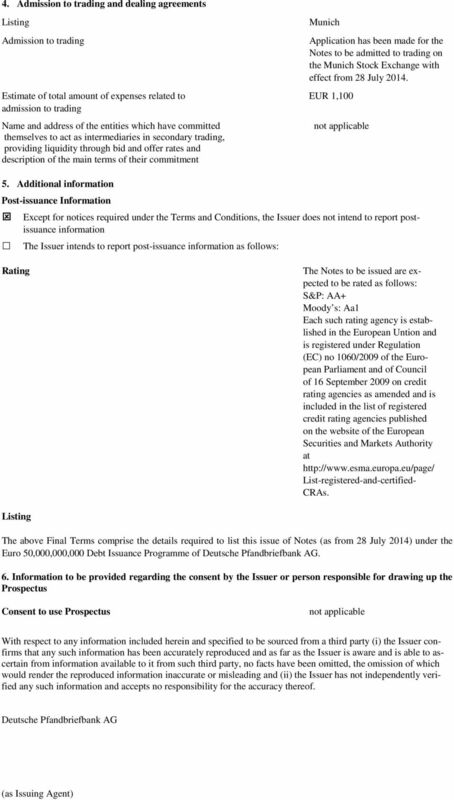 per annum Yes Note that the designation "yes" simply means that the Notes are intended upon issue to be deposited with one of the ICSDs as common safe keeper or with CBF and does not necessarily mean that the Notes will be recognised as eligible collateral for Eurosystem monetary policy and intra-day credit operations by the Eurosystem either upon issue or at any or all times during their life. Such recognition will depend upon satisfaction of the Eurosystem eligibility criteria. Final Terms Endgültige Bedingungen 2 September 2013 2. September 2013 SEK 250,000,000 2.50 per cent. Mortgage Pfandbriefe due 5 September 2016 SEK 250.000.000 2,50 % Hypothekenpfandbriefe fällig am 5. FINAL TERMS Prospective purchasers of these Notes should be aware that the amounts of interest and the return of principal on these Notes is linked to a variable interest rate, as more fully set out herein. Endgültige Bedingungen Final Terms 7. September 2015 7 September 2015 EUR 500.000.000 0,375 % Hypothekenpfandbriefe fällig am 9. 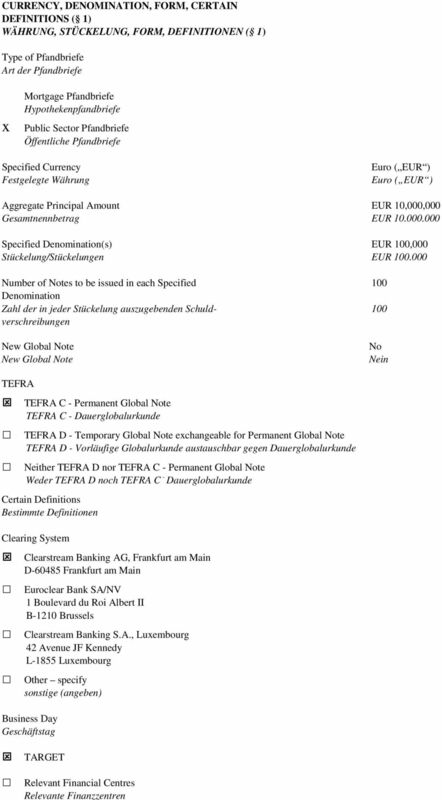 September 2020 (die "Schuldverschreibungen") EUR 500,000,000 0.375 per cent. The Final Terms will be displayed on the website of Berlin-Hannoversche Hypothekenbank Aktiengesellschaft (www.berlinhyp.de). ENDGÜLTIGE BEDINGUNGEN FINAL TERMS EUR 150.000.000 variabel verzinsliche Öffentliche Pfandbriefe mit Zinsbegrenzung fällig am 16. Final Terms Endgültige Bedingungen 20 February 2014 20. Februar 2014 SEK 500,000,000, 2.10 per cent. Mortgage Pfandbriefe due 23 February 2018 SEK 500.000.000 2,10 % Hypothekenpfandbriefe fällig am 23. Final Terms Endgültige Bedingungen. BMW Finance N.V.
Endgültige Bedingungen Final Terms 16. Januar 2017 16 January 2017 EUR 750.000.000 0,625 % Hypothekenpfandbriefe fällig am 18. Januar 2027 (die "Schuldverschreibungen") EUR 750,000,000 0.625 per cent. The Final Terms will be displayed on the website of FMS Wertmanagement (www.fms-wm.de) if the Notes are listed on any stock exchange.